With the CIL series, COVAL introduces a new range of “just-plug-it-in” vacuum modules. The in-line CIL vacuum modules are mounted directly in the compressed air network, very close to the suction cup, without needing any additional fixing. Result: Gripping time is reduced while eliminating energy loss. With the “just-plug-it-in” connection and its optimal performance, the CIL module guarantees a reduction in assembly time as well as in installation and use costs. GVPS series vacuum pumps control vacuum generation using an integrated valve. This installation simplifies wiring and reduces vacuum pump response times. The valve is electrically controlled (24 V DC). 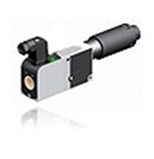 For the same nozzle diameter, the suction flow rate increases when reducing the maximum vacuum level. As well as use with suction cups, they can be used for applications related to dosing liquid, spraying and tank depressurization.